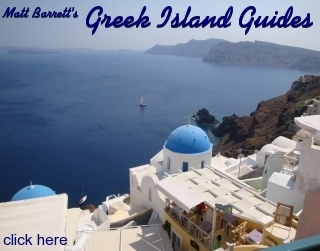 Buying music CD's in Greece is tough for many people because they don't know what to get. Most opt for Theodorakis, a collection of Greek dance instrumentals or anything with Zorba's theme song or Never on Sunday on it. These are all fine. But I think I have pretty good taste in Greek music and it would be a mistake not to share some of my favorites. You can print this page out and take it to a record store and be assured that whatever CD you ask for from my top 25 will be pretty good. For more information on Rembetika music and other Greek music visit www.greecetravel.com/music and also be sure to visit my pages on Athens Nightlife, club listings, and my guide to Psiri, the nightlife district of Athens. #1. The Greece of Yannis Papaioannou: This is my favorite album. Rembetika and laika from the 40's, 50's and 60's. I consider Papaioannou, Tsitsanis and Kalderas Greece's top composers of popular music. #2. 30 years of Kaldaras. From the 50's and 60's. Great songs by a man who in my opinion is one of Greece's top 3 composers. This is a collection of original recordings. The 10 Years of Kalderas listed at # 12 are new recordings of old songs. #3. Thelo Na Ta Po. George Dalaras does songs of Akis Panou. Recorded in the 70's. Great songs and production. The song titled Xarakopou 1942-1953 is a masterpece. George Dalaras is an amazing singer. #4. Rembetika Tis Katohis. Dalaras plays the songs of the Nazi occupation of WWII and the civil war which followed. Comes with a little book about the period, and lyrics. #5. The Greece of Tsitsanis. This could easily be in my top 3 and some people may question my taste because I have it all the way down at number 5 and Vassilis Tsitsanis is generally recognized as Greece's Greatest composer. #7. Stratos Dionysiou 1960-1990. Probably the most popular singer of the sixties and early seventies. Beautiful voice. #8. 50 Years of Rembetika Songs. Sung by George Dalaras this album contains the greatest songs by the most well known and (some lesser known) composers. #9. Sotira Bellou sings Tsitsanis. There is a whole collection of these. This one is my favorite. You may not like her voice at first but it grows on you. #10. 30 Years of Mitsakis. Rembetika from during the Second World War and after. #11. Ten Years Songs: Apostolis Kaldaras. Another collection with different songs recorded by Dalaras, Haris Alexiou, Giannis Parios and Stelios Kazantzides. #12. Afieroma by Stelios Kazantzidis. This is a collection of old (and not so old) Rembetika songs but recorded in the late nineties. Terrific sound and band. Wonderful voice. #13. Loukas Daralas. This double LP-CD is hard to find. Daralas was the father of Dalaras, a sort of marginal star who some say squandered his talent. But his album Enas Rembetis is excellent and his hit 'To Vouno' is one of the most famous Greek songs. #14. Nikos Gounaris and Trio Belkanto. My wife's 80 year old aunts bought this for me because I heard Nikos Gounaris voice one night in a taverna and asked who it was. It's like listening to a Greek version of the Kingston trio. These guys can really play. #15 Stratos Pagioumitsis. This is one of a series. I have several of these but this one is my favorite. Original recordings from 78's from the thirties. #16 Poly Panou's Big Hits. There are two of these. I like the black one. She sang with just about everyone in the 60's and still sings today. #18. Greece is Gold. Yes this is one of those collections I mentioned. But this one is special. We call it The Greatest Hits of the Junta because these were the songs that were popular from around 1967-1974 when the military was in power in Greece. But this is a very spirited collection. #19-23. My favorite was Dionysious Savopoulos, a sort of Greek hybrid of Bob Dylan and Frank Zappa with strong traditional influences as well as rock. Some of my friends are disappointed in his recent work, say the last 15 years or so. But these 5 are classics. It's not Zorba. You may not like him, but then again you may love him. Take a chance on one of these. #24 Pino Kai Metho is a great selection of old Rembetika and Laika songs sung by the best singers of today, namely Glykeria, Agathonas, Gkoles, and my favorite Babis Tsertos. The title song is the anthem for anyone who believes life is for living. This could easily be in my top 5 but I did not feel like rearranging the whole page. #25 Erotopoleion is a collection of old Rembetika, Smyrnika, Traditional and Laika songs from the 1930's through the 50's performed by Babis Tsertos and some great musicians. Another terrific album by Tsertos is Aktimi Tichos. Both albums are a good introduction to the different styles of Greek music and are well produced, in fact the production is exceptional on all of Tsertos albums. 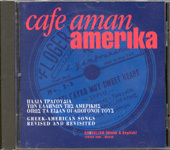 I recommend the CD Cafe Aman Amerika by Gregoris Maninakis and Anna Paidoussi. This CD was given to me many years ago by the owner of a small cafe in Lesvos and was relatively unavailable at the time. It is a collection of songs of the Greeks in New York, Chicago and San Francisco and mixes rembetika, popular music,swing, jazz in a CD of masterful musicianship and a great choice of material. My album of the month, or year, or maybe forever is the album Iparchi Kai...To Zeimbekiko by Dimitris Mitropanos, Themis Adamantidis and Dimitris Mpasis which was recorded live at the Akti in Pireaus. This double album is a collection of moving songs in the slow and dramatic zeimbekiko style. For those who have been to a Greek club or restaurant the zeimbekiko is the dance that is usually done solo and is an expression of passion whether it be sadness or feeling the music. This album begins with an instrumental by Xarchakos and then introduces the singers as they each to a verse of Savaopoulos' classic Zeimbekiko which is my all time favorite song. It only gets better from there. The band is as tight as the best rock act and the sound for a live recording is excellent. But what really makes this album is the passion of the music and the vocal abilities of three GREAT singers. The Greeks have always been known as good singers as far back as the Roman empire and one would assume before. For a lesson on what great singers sound like buy this album and if you are like me you will listen to it endlessly. Mitropanos is a God and the other two guys are not far behind. Its a double album and many of the songs are so familiar that the audience sings on the choruses. You may find yourself singing too. I do. Here are some other favorite CDs of mine that I have discovered since putting together my top 25 Greek CDs: Yannis Kotsiras-Live, Dimitris Mitropanos-Zembekiko (live), Mikis Theodorakis-Laika(I think his best album), Grigoris Mbithikotsis-Any of his collections of hits especially 36 Chronia, Glykeria-Traditional and Rembetika Songs, Haris Alexiou-Ta Tsilika. I also like the Xrisis Discothiki collection of hits for every year from around 1950 to 1990. The best years are the early ones up to about 1972. You can usually find these at discounted prices. There are a zillion record shops in Athens. Between Panapistimiou and Stadiou streets there are a couple stoas (like streets but covered so they are indoors) with different themes. In the Stoa Pezmazoglou at 39 Panepistimiou, right across from the University there is a very interesting little music shop called Nikos Xilouris. Xilouris is to Cretan music as Hank Williams is to country music and this tiny store is full of his CDs, DVDs, books and memorabilia plus music by other Cretan, Rembetika and Laika musicians. 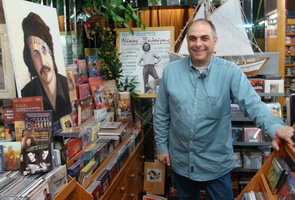 The shop is owned by his son Giorgos Xilouris (photo) and is a great place to buy Greek music or just to stop in and say hello if you are a Xilouris fan.